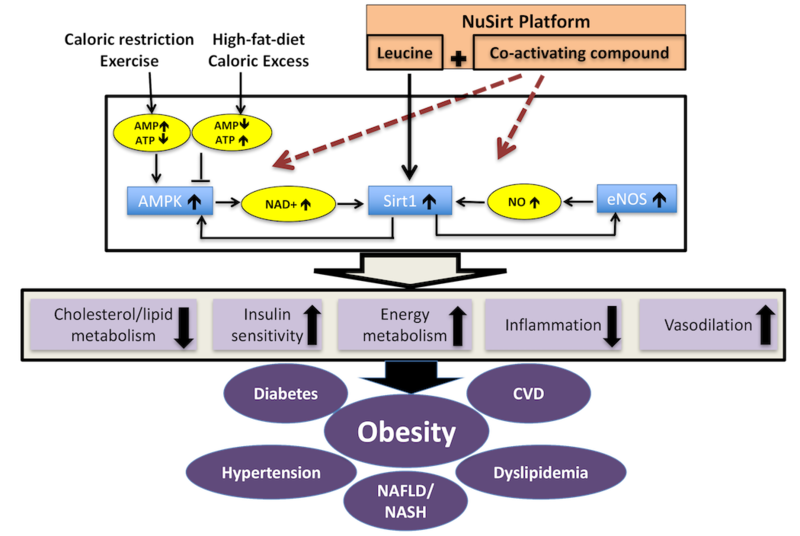 NuSirt’s technology platform focuses on activating sirtuin pathways through the administration of natural compounds in specific combinations at precise doses. The scientific literature has established that activation of the Sirt1 and Sirt3 pathways can significantly improve insulin sensitivity and reduce risks associated with metabolic diseases such as fatty liver disease, diabetes, high blood pressure, cardiovascular inflammation, obesity and others. Companies have attempted to activate sirtuin pathways with synthetic pharmaceuticals; however, none have been approved and safety concerns remain. NuSirt’s research clearly demonstrates that it can activate sirtuin pathways safely and effectively. NuSirt has conducted five randomized, placebo-controlled, double blind clinical trials (RCT) on combinations of natural compounds, as well as pre-clinical work on the natural compounds in combination with known pharmaceuticals. These RCTs demonstrate two important value propositions for the Company and investors. First, NuSirt’s patented natural compounds can serve as safe, standalone therapeutics or synergize with well-known pharmaceuticals. Second, NuSirt’s unique approach creates the potential for lower cost, lower risk development of new pharmaceuticals and retail products.